How can you fail at a race you didn’t run, or more exactly at a race you couldn’t run. No New York. I am under trained and alone. This year I didn’t make the effort to get ready for the race. I worked hard and went through so many things but running suffered and the loneliness was a huge factor. The race was cancelled and I almost feel relieved because then there is no 3:05 in my file that I have to explain to almost no one. I think it would have been a 2:57 or slightly better but I know it wasn’t going to be my finest hour. I can easily see the struggle up the side of Central Park, the series of rallies in the park and then the long looks up Central Park South as I put hands on hips and gathered myself for the last mile. I have been there before, actually most years or at least half of the years. At 49 I am not playing with house money anymore. A bit of remaining talent and hard work must carry the day, no more youthful fire that can take moderate training and create a magical day. I have a small but growing feeling that running is slowly falling from me. This time off has not made me hungry but has made me scared. I think I am scared. I think we are all scared of our finest moments. We are all scared of what we have done and becoming a fraud by what will do next. You can never take away the grandness of your greatest moments but you can always not live up to them and then you just don’t have it anymore. Strangely I rarely find myself competing against others, that happened when I was young, now I find myself competing with me. This is most difficult when you are not who you were. Aging gracefully is not competing with your younger you but being at peace with who you are at this time in your life. This means I am old, in the numerical and physical sense but also in my time. My time was 1:10 in a half or 31:57 in a 10K but my time was also piggybacks and homework with Kate (now I am crying) and that is not my time now and I am not at peace with this time. Perhaps another bike trip through some foreign land or a race that remembers the old days will help me find some of what was – like last march when I ran 1:15 flat at Peterborough or 1:52 at Around The Bay. These are not days gone by but days that just went by. So off to the Grand Canyon with Kyle, or off to Boston for a 2:47 or perhaps Mongolia, though a trip across the US seems more likely and less expensive. Did I fail? I was feeling quite down and sometimes quite lonely. A winter at my cottage is both very very cold, only a wood stove and a small fireplace for heat, and pretty isolated. An incredible best friend in Maddie, my golden retriever, and 3 cats who were always snuggling under multiple duvets, did make for wonderful companions though. I am not sure why I am sharing this but here it is. 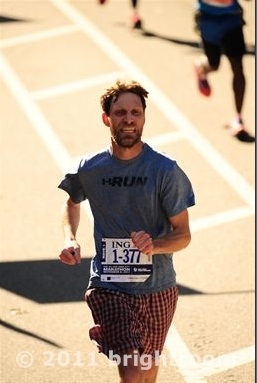 As part of Toronto True Running I am hoping to share some stories, moments and ideas I have related to running. Some of these will be philosophical in nature and others more practical. Most will be centred on the theme of why we run. Trail running is my time to escape the city within the city. A time to leave the streets and hunt for the wild life. Mountain bikers dominate the trails and are incredibly free and loose. Animals including Deer, coyotes, skunks, hawks, raccoons and on on flourish in the seldom seen spots of the woods. There I also find my place without any limits but my own. No stop lights or impersonal cars. No strollers or driveways. I can run forever almost ever on the single track dirt trails which snake all over the side of the Don Valley. I figure if I were to measure all the trails I know, there might easily be 50 kms but I have not yet explored all. Lots of paths and sidetracks veer off in many places where I have not yet ventured. Toronto True Running invites you come explore this peace and quiet with us, well me. The groups are limited to 10 per sessions and offer personal attention to your running. That's my "Wave" for now. I hope you wave back.